Synopsis, Our Opinion: Excellent California Pinot Noir. 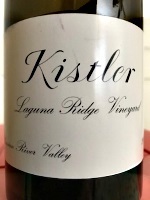 Producer/Winery: Kistler Vineyards; Sebastopol, California. 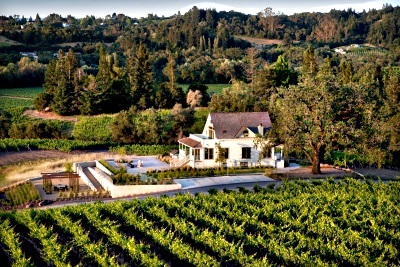 Geographic Appellation: Russian River Valley; Sonoma County, California. Paired With: Venison roulade with mushroom sauce, homemade butternut squash ravioli with sage butter sauce and grilled asparagus with creamy Caesar dressing and topped with shaved Parmesan cheese. Opened two hours before drinking. Opaque, inky dark purple color with the same color rim. Potent earthy unidentifiable dark fruit aromas with enduring elements of wet wood. Smooth, fleshy, medium-weight body and a rather rough 100-grit texture. Sultry dry blackberry, cranberry and plum flavors (but hints of ripe raspberry) that stay forever. Lots of mid-palate fresh acidity that ends with an explosive finish filled with dry, mouth-puckering tannins and sunny California fruit taste. This could easily be described as big and bold, but it could also be characterized as alluring, fruity and composed of layers of delicious flavors. This was no one-dimensional California Pinot Noir…it was very delicious, intoxicating and paired well with the venison roulade with mushroom sauce. There was clearly an edginess that’s not found in red Burgundy. This is expensive wine…but is it worth the price. We bought it so I guess the real question is would we buy it again? The answer is it was FANTASTIC, but I’d try another “new world” Pinot Noir before I would buy this again…it just wasn’t “special” nor was it what our palate says Pinot Noir should be…it was more California than Burgundian!!! Just a little side note: We had the opportunity to drank this blind, side-by-side with Robert Chevillon Nuits-Saint-Georges 1er Cru Les Vaucrains 2014, a comparably priced red Burgundy. All seven tasters at the table identified this as the New World wine and all seven preferred the Robert Chevillon (even though five of the seven tasters are California wine drinkers and say they prefer California wines!!!). Having the chance to sip the two side-by-side really revealed the difference in the two wines and if we wanted Pinot Noir at this price point again we would buy the Robert Chevillon in a flash. Comments: Learn more about Kistler Vineyards and their wines.